Barrels and fencing mark the construction zone at the site of a future Swift station on westbound 132nd St. and Elgin Way/Dumas Rd. The forecast of a stormy weekend has postponed plans for weekend-long double-lane closures at multiple station construction sites. Swift Network News provides the most up-to-date construction information available at publication, but construction schedules are subject to change at any time. For more information about construction areas, including a map, see the related article on page 2. One southbound lane of Bothell-Everett Hwy. will be closed from 9 a.m. to 2 p.m. at Trillium Blvd. every day next week while crews complete underground electrical work for the future Swift station. 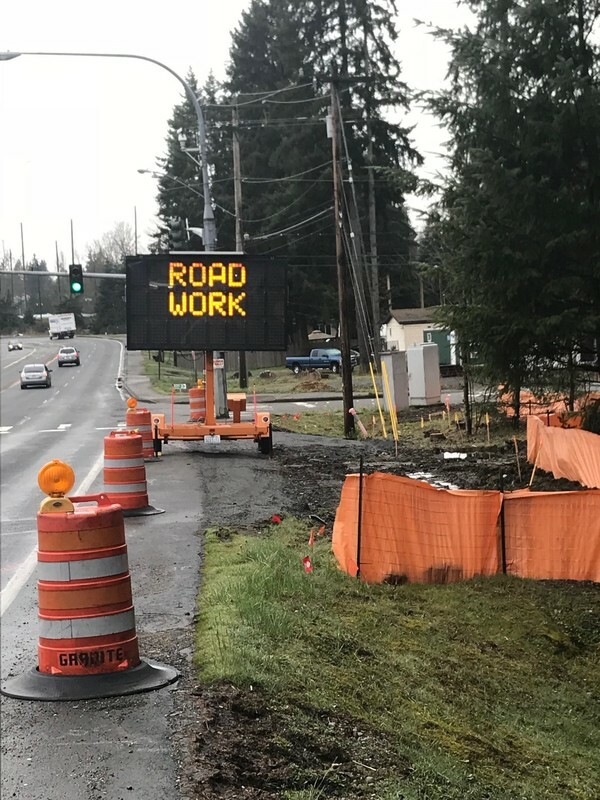 Stormwater drainage work continues at the site of the northbound Trillium station, with single-lane closures expected on Monday and Tuesday next week from 8 p.m. to 4 a.m.
Construction is scheduled to begin on northbound Bothell-Everett Hwy. at 153rd St. the week of April 16. Weather delays have disrupted the construction schedule for Area 2, but daytime work (9 a.m. to 2 p.m.) can be expected at westbound 128th St. at 4th Ave. and 3rd Ave. Weather permitting, one lane of northbound Airport Rd. at 100th St. will be closed a few days next week to install a curb and sidewalk at the future station site. 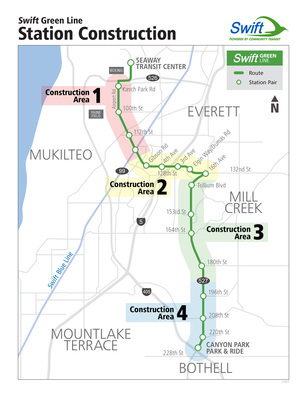 Community Transit staff will answer questions about Swift Green Line construction at a Mill Creek Open House from 5:30-7:30 p.m. on Thursday, April 12. The City of Mill Creek is holding this event to inform residents about several construction projects that will be impacting the community this year, including the Swift Green Line. The event will take place at Mill Creek City Hall North, Large Community Room, 15720 Main Street in Mill Creek. Tuesday, April 24 at 4 p.m. If you cannot attend the live webcast, a recording of it will be posted on our website and Facebook. A recording with subtitles is posted within two business days. Concrete projects are planned for both the Seaway Transit Center site and along 75th St. next week, but may be delayed if the current forecast for a rainy week proves correct. Construction crews often decide to postpone paving projects during wet weather to avoid the risk of water affecting the durability and strength of the concrete mix. Compacted gravel is in place and ready to serve as a base for concrete driveways and bus platforms. Weather permitting, concrete pouring will begin next week. Paving the entire site is expected to take at least a month. Masonry brick for the mechanical building will begin to be installed next week. The entire installation will take several weeks and will bring the exterior nearly to completion. Traffic signal power and data control conductors are now complete. The signals will be activated within 2-3 weeks. Driveways for businesses on 75th St. east of PUD will be rebuilt beginning next week, if the weather is dry enough to pour concrete. The poles stretching over eastbound lanes of traffic just before the I-5 overpass are scheduled to receive traffic signs and lighting next week. The installation will require closing the far-right lane of eastbound traffic from 9 a.m. to 2 p.m. every day next week. The southbound on-ramp will remain open. Next week, construction crews will prepare for the installation of a sidewalk along westbound 128th St. from 3rd Ave. to the Shell station. The sidewalk, along with a curb and gutter, is scheduled for installation the following week.